Gold ( IPA: /ˈgəʊld/) is a highly sought-after precious metal that for many centuries has been used as money, a store of value and in jewelry. The metal occurs as nuggets or grains in rocks and in alluvial deposits and is one of the coinage metals. It is a soft, shiny, yellow, dense, malleable, and ductile (trivalent and univalent) transition metal. Modern industrial uses include dentistry and electronics. Gold forms the basis for a monetary standard used by the International Monetary Fund (IMF) and the Bank for International Settlements (BIS). Its ISO currency code is XAU. Gold is a chemical element in the periodic table with the symbol Au (from the Latin aurum) and atomic number 79. The adjective auric refers to something made of gold. Gold does not react with most chemicals but is attacked by chlorine, fluorine, aqua regia and cyanide. Gold dissolves in Mercury. In particular, gold is insoluble in nitric acid, which will dissolve most other metals. Nitric acid has long been used to confirm the presence of gold in items. Gold is a metallic element with a characteristic yellow colour, but can also be black or ruby when finely divided, while colloidal solutions are intensely colored and often purple. These colors are the result of gold's plasmon frequency lying in the visible range, which causes red and yellow light to be reflected, and blue light to be absorbed. Only silver colloids exhibit the same interactions with light, albeit at a shorter frequency, making silver colloids yellow in colour. It is the most malleable and ductile metal known; a single gram can be beaten into a sheet of one square meter, or an ounce into 300 square feet. Gold readily forms alloys with many other metals. These alloys can be produced to increase the hardness or to create exotic colors. Adding copper yields a redder metal, iron blue, aluminium purple, platinum metals white, and natural bismuth together with silver alloys produce black. Native gold contains usually eight to ten per cent silver, but often much more — alloys with a silver content over 20% are called electrum. As the amount of silver increases, the colour becomes whiter and the specific gravity becomes lower. Gold is a good conductor of heat and electricity, and is not affected by air and most reagents. Heat, moisture, oxygen, and most corrosive agents have very little chemical effect on gold, making it well-suited for use in coins and jewelry; conversely, halogens will chemically alter gold, and aqua regia dissolves it. Common oxidation states of gold include +1 (gold(I) or aurous compounds) and +3 (gold(III) or auric compounds). Gold ions in solution are readily reduced and precipitated out as gold metal by the addition of virtually any other metal as the reducing agent. The added metal is oxidized and dissolves allowing the gold to be displaced from solution and be recovered as a solid precipitate. Recent research undertaken by Frank Reith of the Australian National University shows that microbes play an important role in the formation of gold deposits, transporting and precipitating gold to form grains and nuggets that collect in alluvial deposits. The concentration of free electrons in gold metal is 5.90×1022 cm-3. Pure gold is too soft for ordinary use and is hardened by alloying with silver, copper, and other metals. Gold and its many alloys are most often used in jewelry, coinage and as a standard for monetary exchange in various countries. When selling it in the form of jewelry, gold is measured in karats (k), with pure gold being 24k. However, it is more commonly sold in lower measurements of 22k, 18k, and 14k. A lower "k" indicates a higher percent of copper or silver mixed into the alloy, with copper being the more commonly used metal between the two. Fourteen karat gold-copper alloy will be nearly identical in colour to certain bronze alloys, and both may be used to produce police and other badges. Eighteen karat gold with a high copper content is found in some antique jewelry and will have a distinct, though not dominant copper cast, giving an attractively warm color. A similar karat weight when alloyed with silvery metals will appear less warm in colour, and some low karat white metal alloys may be sold as "white gold", silvery in appearance with a sightly yellow cast but far more resistant to corrosion than silver or sterling silver. Karat weights of twenty and higher are more common in modern jewelry. Because of its high electrical conductivity and resistance to corrosion and other desirable combinations of physical and chemical properties, gold also emerged in the late 20th century as an essential industrial metal, particularly as a thin plating on printed circuit board contacts and electrical connectors. Gold can be made into thread and used in embroidery. Gold is ductile and malleable meaning it is able to be drawn into very thin wire and can be beaten into very thin sheets known as Gold leaf. Gold produces a deep, intense red colour when used as a coloring agent in glass. Gold performs critical functions in computers, communications equipment, spacecraft, jet aircraft engines, and a host of other products. The resistance to oxidation of gold has led to its widespread use as thin layers electroplated on the surface of electrical connectors to ensure a good connection. Gold alloys are used in restorative dentistry especially in tooth restorations such as crowns and permanent bridges as their slight malleability makes a superior molar mating surface with other teeth, unlike a harder ceramic crown. Use of gold crowns in more prominent teeth such as incisors is favored in some cultures and discouraged in others. Colloidal gold (a gold nanoparticle) is an intensely colored solution that is currently studied in many labs for medical, biological and other applications. It is also the form used as gold paint on ceramics prior to firing. Chlorauric acid is used in photography for toning the silver image. Gold(III) chloride is used as a catalyst in organic chemistry. It is also the usual starting point for making other gold compounds. Gold is used as a coating enabling biological material to be viewed under a scanning electron microscope. Since it is a good reflector of both infrared and visible light, it is used for the protective coatings on many artificial satellites and on astronauts' helmets to prevent blindness from the sun. Disodium aurothiomalate is a treatment for rheumatoid arthritis (administered intramuscularly). It inhibits lymphocyte proliferation, lysosomal enzyme release, the release of reactive oxygen species from macrophages, and IL-1 production. However, it can also cause photosensitive rashes, gastrointestinal disturbance, and kidney damage. The isotope gold-198, ( half-life: 2.7 days) is used in some cancer treatments and for treating other diseases. Gold flake is used on and in some gourmet sweets and drinks. Called varak or (varaq) in India. Having no reactivity it adds no taste but is taken as a delicacy. Some use it as an excuse to create super-expensive delicacies ($1,000 cocktails). For similar reasons, it is also used as the basis for some superstitious, over the top, health claims. Only the salts and radioisotopes (mentioned above) have any evidence of medicinal value. White gold (an alloy of gold with platinum, palladium, nickel, and/or zinc) serves as a substitute for platinum. Green gold (a gold/silver alloy) is used in specialized jewelry while gold alloys with copper (reddish colour) are more widely used for that purpose ( rose gold). 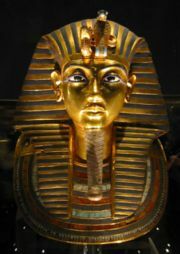 Gold has been known and highly valued since prehistoric times. It may have been the first metal used by humans and was valued for ornamentation and rituals. Egyptian hieroglyphs from as early as 2600 BCE describe gold, which king Tushratta of the Mitanni claimed was as "common as dust" in Egypt. Egypt and Nubia had the resources to make them major gold-producing areas for much of history. Gold is also mentioned several times in the Old Testament. The south-east corner of the Black Sea was famed for its gold. Exploitation is said to date from the time of Midas, and this gold was important in the establishment of what is probably the world's earliest coinage in Lydia between 643 and 630 BCE. The European exploration of the Americas was fueled in no small part by reports of the gold ornaments displayed in great profusion by Native American peoples, especially in Central America, Peru, and Colombia. Gold has long been considered one of the most precious metals, and its value has been used as the standard for many currencies (known as the gold standard) in history. Gold has been used as a symbol for purity, value, royalty, and particularly roles that combine these properties (see gold album). Gold as a sign of wealth and prestige was made fun of by Thomas More in his treatise Utopia. On that imaginary island, gold is so abundant that it is used to make chains for slaves, tableware and lavatory-seats. When ambassadors from other countries arrive, dressed in ostentatious gold jewels and badges, the Utopians mistake them for menial servants, paying homage instead to the most modestly-dressed of their party. There is an age-old tradition of biting gold in order to test its authenticity. Although this is certainly not a professional way of examining gold, the bite test should score the gold because gold is considered a soft metal according to the Mohs' scale of mineral hardness. The purer the gold the easier it should be to mark it. Painted lead can cheat this test because lead is softer than gold. Gold in antiquity was relatively easy to obtain geologically; however, 75% of all gold ever produced has been extracted since 1910. It has been estimated that all the gold in the world that has ever been refined would form a single cube 20 m (66 ft) on a side (8000 m³). The primary goal of the alchemists was to produce gold from other substances, such as lead — presumably by the interaction with a mythical substance called the philosopher's stone. Although they never succeeded in this attempt, the alchemists promoted an interest in what can be done with substances, and this laid a foundation for today's chemistry. Their symbol for gold was the circle with a point at its centre (☉), which was also the astrological symbol, the Egyptian hieroglyph and the ancient Chinese character for the Sun (now 日). For modern attempts to produce artificial gold, see gold synthesis. During the 19th century, gold rushes occurred whenever large gold deposits were discovered, including the California, Colorado, Otago, Australian, Witwatersrand, Black Hills, and Klondike gold rushes. Because of its historically high value, much of the gold mined throughout history is still in circulation in one form or another. Due to its relative chemical inertness, gold is usually found as the native metal or alloy. 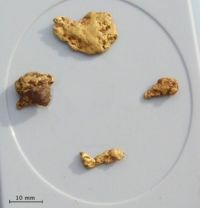 Occasionally large accumulations of native gold (also known as nuggets) occur, but usually it occurs as minute grains. These grains occur between mineral grain boundaries or as inclusions within minerals. Common gold associations are quartz often as veins and sulfide minerals. The most common sulfide associations are pyrite, chalcopyrite, galena, sphalerite, arsenopyrite, stibnite and pyrrhotite. Rarer mineral associations are petzite, calaverite, sylvanite, muthmannite, nagyagite and krennerite. Gold is widely distributed in the Earth's crust at a background level of 0.03 g/1000 kg (0.03 ppm by weight). Hydrothermal ore deposits of gold occur in metamorphic rocks and igneous rocks; placer deposits originate from these sources. The primary source of gold is usually igneous rocks or surface concentrations. A deposit usually needs some form of secondary enrichment to form an economically viable ore deposit: either chemical or physical processes like erosion or solution or more generally metamorphism, which concentrates the gold in sulfide minerals or quartz. 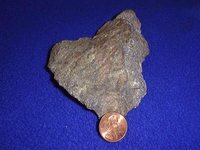 There are several primary deposit types, common ones are termed reef or vein. Primary deposits can be weathered and eroded, with most of the gold being transported into stream beds where it congregates with other heavy minerals to form placer deposits. In all these deposits the gold is in its native form. Another important ore type is in sedimentary black shale and limestone deposits containing finely disseminated gold and other platinum group metals. Gold occurs in sea water at 0.1 to 2 mg/ t (0.1 to 2 ppb by weight) depending on sample location. Economic gold extraction can be achieved from ore grades as little as 0.5 g/1000 kg (0.5 ppm) on average in large easily mined deposits. Typical ore grades in open-pit mines are 1–5 g/1000 kg (1-5 ppm), ore grades in underground or hard rock mines are usually at least 3 g/1000 kg (3 ppm) on average. Since ore grades of 30 g/1000 kg (30 ppm) are usually needed before gold is visible to the naked eye, in most gold mines you will not see any gold. Since the 1880s, South Africa has been the source for a large proportion of the world’s gold supply. Production in 1970 accounted for 79% of the world supply, producing about 1,000 tonnes. However, production in 2004 was 342 tonnes. This decline was due to the increasing difficulty of extraction and changing economic factors affecting the industry in South Africa. The city of Johannesburg was built atop the world's greatest gold finds. 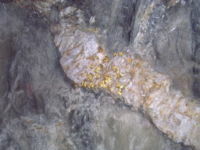 Gold fields in the Free State and Gauteng provinces are deep and require the world's deepest mines. The Second Boer War of 1899– 1901 between the British Empire and the Afrikaner Boers was at least partly over the rights of miners and possession of the gold wealth in South Africa. Other major producers are Canada, United States and Australia. Mines in South Dakota and Nevada supply two-thirds of gold used in the United States. Siberian regions of Russia also used to be significant in the global gold mining industry. Kolar Gold Fields in India is another example of a city being built on the greatest gold deposits in India. In South America, the controversial project Pascua Lama aims at exploitation of rich fields in the high mountains of Atacama, at the border between Chile and Argentina. Today about one-quarter of the world gold output is estimated to originate from artisanal or small scale mining. After initial production, gold is often subsequently refined industrially by the Wohlwill process or the Miller process. Other methods of assaying and purifying smaller amounts of gold include parting and inquartation as well as cuppelation, or refining methods based on the dissolution of gold in aqua regia. The world's oceans hold a vast amount of gold, but in very low concentrations (perhaps 1-2 parts per billion). Fritz Haber (the German inventor of the Haber process) attempted commercial extraction of gold from sea water in an effort to help pay Germany's reparations following the First World War. Unfortunately, his assessment of the concentration of gold in sea water was unduly high, probably due to sample contamination. The effort produced little gold and cost the German government far more than the commercial value of the gold recovered. No commercially viable mechanism for performing gold extraction from sea water has yet been identified. Gold synthesis is not economically viable and is unlikely to become so in the foreseeable future. The average gold mining and extraction costs are $238 per troy ounce but these can vary widely depending on mining type and ore quality. In 2001, global mine production amounted to 2,604 tonnes, or 67% of total gold demand in that year. At the end of 2001, it was estimated that all the gold ever mined totalled 145,000 tonnes. Like other precious metals, gold is measured by troy weight and by grams. When it is alloyed with other metals the term carat or karat is used to indicate the amount of gold present, with 24 karats being pure gold and lower ratings proportionally less. The purity of a gold bar can also be expressed as a decimal figure ranging from 0 to 1, known as the millesimal fineness, such as 0.995. The price of gold is determined on the open market, but a procedure known as the Gold Fixing in London, originating in 1919, provides a twice-daily benchmark figure to the industry. Historically gold was used to back currency; in an economic system known as the gold standard, a certain weight of gold was given the name of a unit of currency. For a long period, the United States government set the value of the US dollar so that one troy ounce was equal to $20.67 ($664.56/kg), but in 1934 the dollar was revalued to $35.00 per troy ounce ($1125.27/kg). By 1961 it was becoming hard to maintain this price, and a pool of US and European banks agreed to manipulate the market to prevent further currency devaluation against increased gold demand. 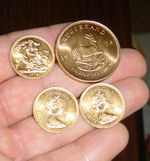 On 17 March 1968, economic circumstances caused the collapse of the gold pool, and a two-tiered pricing scheme was established whereby gold was still used to settle international accounts at the old $35.00 per troy ounce ($1.13/g) but the price of gold on the private market was allowed to fluctuate; this two-tiered pricing system was abandoned in 1975 when the price of gold was left to find its free-market level. Central banks still hold historical gold reserves as a store of value although the level has generally been declining. The largest gold depository in the world is that of the U.S. Federal Reserve Bank in New York. 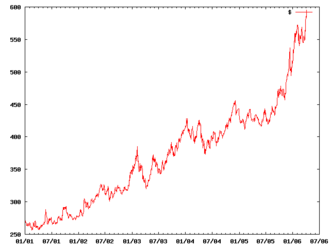 Since 1968 the price of gold on the open market has ranged widely, with a record high of $850/oz ($27,300/kg) on 21 January 1980, to a low of $252.90/oz ($8,131/kg) on 21 June 1999 (London Fixing). On 11 May 2006 the London gold fixing was $715.50/oz ($23,006/kg). Over 2005 the World Gold Council estimated total global gold supply to be 3,859 tonnes and demand to be 3,754 tonnes, giving a surplus of 105 tonnes. Although gold is a noble metal, it can form many compounds, gold(III) chloride (AuCl3) and chlorauric acid (HAuCl4) being the most common. Gold compounds can be gold(I) (aurous, univalent, +1), gold(II) (organometallic compounds such as [Au(CH2)2P(C6H5)2]2Cl2 contain divalent gold, +2) or gold(III) (auric, trivalent, +3). Gold also can under extreme conditions form a +5 and even a +7 state with fluorine (gold pentafluoride, AuF5 and the extremely rare gold heptafluoride, AuF7), as well as a -1 state. Such compounds containing the Au- anion are called aurides and include caesium auride, CsAu, rubidium auride, RbAu, and tetramethylammonium auride, (CH3)4N+ Au-. Some gold compounds are notable for forming what's known as the aurophilic bond, a weak interaction comparable in strength to the hydrogen bond. There is one stable isotope of gold, and 18 radioisotopes with 195Au being the most stable with a half-life of 186 days. Gold has been proposed as a " salting" material for nuclear weapons (cobalt is another, better-known salting material). A jacket of natural gold, irradiated by the intense high-energy neutron flux from an exploding thermonuclear weapon, would transmute into the radioactive isotope Au-198 with a half-life of 2.697 days and produce approximately .411 MeV of gamma radiation, significantly increasing the radioactivity of the weapon's fallout for several days. Such a weapon is not known to have ever been built, tested, or used. The human body does not absorb gold very well, thus compounds of gold are not normally very toxic. Liver and kidney damage has, however, been reported for up to 50% of arthritis patients treated with gold-containing drugs. Gold used in dentistry is widely regarded as the safest form of restorative material, as well as the most successful. As has recently been discovered, solutions containing special sugar-coated gold nano-particles can be used as toxin- indicators. Aurum metallicum (metallic gold) is also used as a homeopathic remedy, claimed to be helpful for people with a depressive nature. Swiss minted 1 kg gold bar. Gold has been associated with the extremities of utmost evil and great sanctity throughout history. In the Book of Exodus, the Golden Calf is a symbol of idolatry and rebellion against God. In Communist propaganda, the golden pocket watch and its fastening golden chain were the characteristic accessories of the class enemy, the bourgeois and the industrial tycoons. Credit card companies associate their product with wealth by naming and colouring their top-of-the-range cards “gold;” although, in an attempt to out-do each other, platinum (and the even-more-elite black card) has now overtaken gold. On the other hand in the Book of Genesis, Abraham was said to be rich in gold and silver. Eminent orators such as John Chrysostom were said to have a “mouth of gold with a silver tongue.” Gold is associated with notable anniversaries, particularly in a 50-year cycle, such as a golden wedding anniversary, golden jubilee, etc. Great human achievements are frequently rewarded with gold, in the form of medals and decorations. Winners of races and prizes are usually awarded the gold medal (such as the Olympic Games and the Nobel Prize), while many award statues are depicted in gold (such as the Academy Awards, the Golden Globe Awards the Emmy Awards, the Palme d'Or, and the British Academy Film Awards). Medieval kings were inaugurated under the signs of sacred oil and a golden crown, the latter symbolizing the eternal shining light of heaven and thus a Christian king's divinely inspired authority. Wedding rings are traditionally made of gold; since it is long-lasting and unaffected by the passage of time, it is considered a suitable material for everyday wear as well as a metaphor for the relationship. In Orthodox Christianity, the wedded couple is adorned with a golden crown during the ceremony, an amalgamation of symbolic rites. The symbolic value of gold varies greatly around the world, even within geographic regions. For example, gold is quite common in Turkey but considered a most valuable gift in Sicily. From most ancient times, gold has been connected to religion and spirituality, especially associated with the Sun. It was also seen as the best material to decorate religious imagery, all over history.